Why Did Moses Go Up on Mt. Sinai for Forty Days? After the Giving of the Torah, Moses went up Mount Sinai for 40 days. After the Golden Calf, he went up another 40 days, and then he went up the final time for yet another 40 days to secure complete forgiveness from G‑d. What’s up with the number 40? 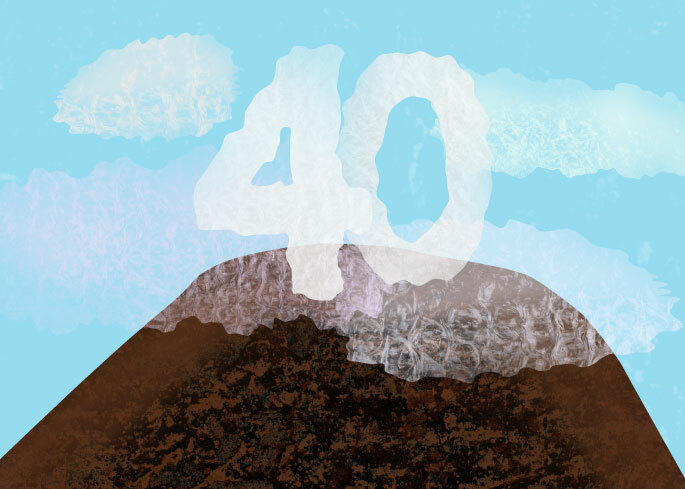 The number 40 is actually highly symbolic in the Torah, but since you ask specifically about why Moses had to go up the mountain for 40 days and nights, I’ll address that first. Why Were They Called "Maccabees"? Why Is Tefillin Worn on the Left Arm? Aufruf: Why Is the Groom Called to the Torah Before His Wedding? In the episode of Noah and the Flood, we learn that it rained for 40 days and 40 nights. A mikvah needs to have 40 se’ah (a measurement) of water in order to be able to purify someone. In fact, this is one of the explanations as to why, during the Flood, it rained for 40 days, corresponding to the 40 se’ah of a mikvah. Regarding the maximum amount of lashes one could get, the Torah describes the amount as 40 (albeit in practice, one could get a maximum of 39). According to the Talmud, it took “40 minus one”5 types of creative work to build the Mishkan (Tabernacle). What is the common thread here? What is the symbolism of the number 40? Kabbalah explains that all of reality can be divided into four worlds: Atzilut (Emanation), Beriah (Creation), Yetzirah (Formation), and Asiyah (Action.) These four worlds, in turn, emanate from and are rooted in the four letters of the holiest name of G‑d. In the Talmud, Rabbi Eliezer says: “The messianic era will be 40 years, as it is stated: ‘Forty years will I strive with the generation.’”12 The commentaries explain that Rabbi Eliezer was not limiting the time of the messianic era. On the contrary, what he is referring to are 40 years of the “messianic era” that will precede and prepare for the Resurrection of the Dead.13 Indeed, the Zohar states that there will be “40 years” until the Resurrection of the Dead14 (or to be more precise, as the Lubavitcher Rebbe explains, it will take 40 years until the resurrection process is completed15). Talmud, Bechorot 21b; see also Talmud, Menachot 99b and Nidah 30a. See, for example, Sforno on Exodus 24:18; Abrabanel on Exodus 24:17 and others. Tzemach Tzedek, Ohr HaTorah, Devorim, vol. 1 p. 18. For an explanation of why we say “40 minus one” instead of “39,” see The 40th Labor. See Likutei Sichot, vol. 39, pp. 185-190, where the Rebbe explains how each set of 40 days are connected with transformation: the first 40 are connected to Torah, the second 40 are connected to prayer, and the last 40 are connected to teshuvah. See for example Torat Menachem, vol. 12, p. 157. A person’s intellect itself also has four levels, chochmah, binah and daat, which is split into chessed and gevurah. For more on this see Worlds and Emanations. For more on this, see Fortysomething. See Torat Menachem 5744, vol. 4, p. 2402. See commentary of Rabbeinu Nissim on Talmud, Sanhedrin 99a. Hamelech Bemesibo, vol. 2, p. 247. Are Dangerous Sports Like Football and Wrestling Kosher? Why Is a Banana a “Vegetable”? Why Is Tanya Called "Tanya"? Why Can't a DNA Test Determine Jewish Status? How Many Sefirot are Involved in Creation? Where Do Ethics Come From?